2) Working on my Mountie story which takes place in the December 1888 with my characters traveling by sleigh. 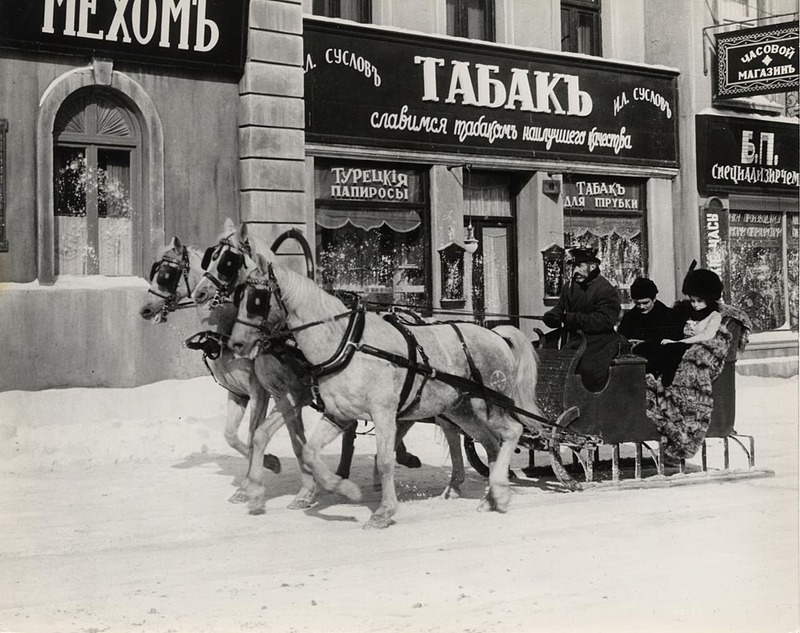 With today's modern vehicles, travel by sleigh is more of a fun activity than a necessity, however as long as there are horses in snowy areas, there will be sleighs. And lets face it, as long as there is a Santa Claus at Christmas, he'll be arriving in a sleigh full of toys, pulled by reindeer. But how accurate are those images we see of Santa's sleigh? 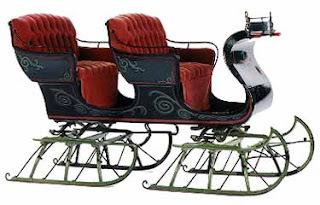 This Portland sleigh is a very common design for Santa sleighs, mainly because it's of the light, cutter class built for speed. At an affordable cost, the cutter provided a cozy atmosphere to cuddle your beau while the high dash kept you clear of the snow kicked up from the horses hooves. This two-seater bobsleigh held a minimum of 4 people and used independent runners for easier maneuverability as well as safer travel. The sleigh didn't tip as easy with the dual runners as it did with those using a long, single runners on each side. 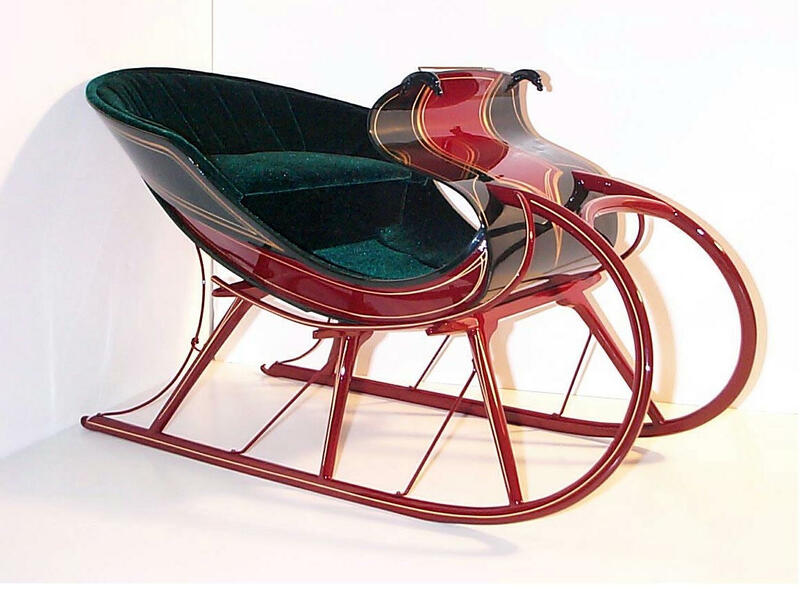 For pure beauty though, you wanted a sleek and rich Albany sleigh. Albany sleighs never reached mass market. 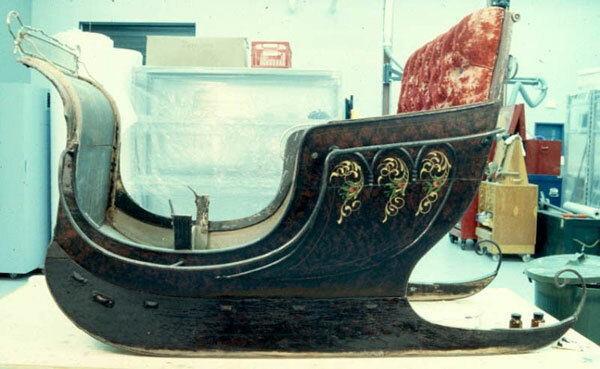 First designed in the early 1820's by James Goold, the cutters were the most expensive sleighs of their time. Whether you ordered a single or two-seater Albany, you were assured of a custom finish to whatever paint and fabric you ordered. The cutter below originally belonged to Henry S. Marlor, a wealthy New York banker who retired to Brooklyn, Conn. Varnished heavily, its original plaid-design panels, gold-leaf tendrils, and gold striping on its patent leather wings are still intact. In the latter part of the 19th century, the H.H. Babcock Company of Watertown, New York manufactured the Babcock sleigh with the same attention to detail as their carriage business. 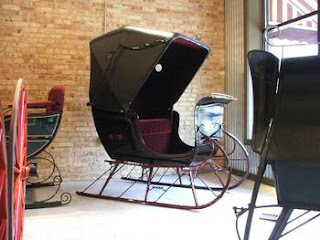 This sleigh is different from others not only because of the unique seat arrangement, but because it is louvered on the sides - more for looks than practical puposes. While researching this subject, I found a photo of this sleigh which it touts as being Canadian, but is actually Russian origin. However, the one billed as Canadian is low to the ground instead of on 12-18" high runners. The Canadian one looks very much like this one on display at the Canada Science and Technology Museum without the driver's seat. This particular carriole was manufactured by Léon D’Amours of Trois-Pistoles, Quebec. This type appears frequently in Canadian paintings. The following photograph taken at Montreal's McGill University in 1898 shows a larger version of the Quebec Carriole, courtesy of the McCord On-line museum. 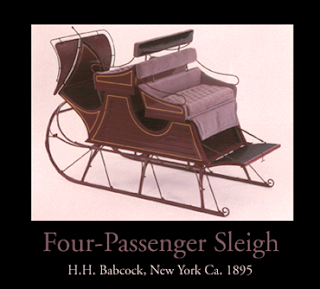 This video shows different types of sleighs in action and explains many more. It's great information although you won't see all of it because it's actually for sale and they're showing a good portion of it to pique your interest. Still, it's great information for the parts you do see. So, did you see a sleigh you liked? 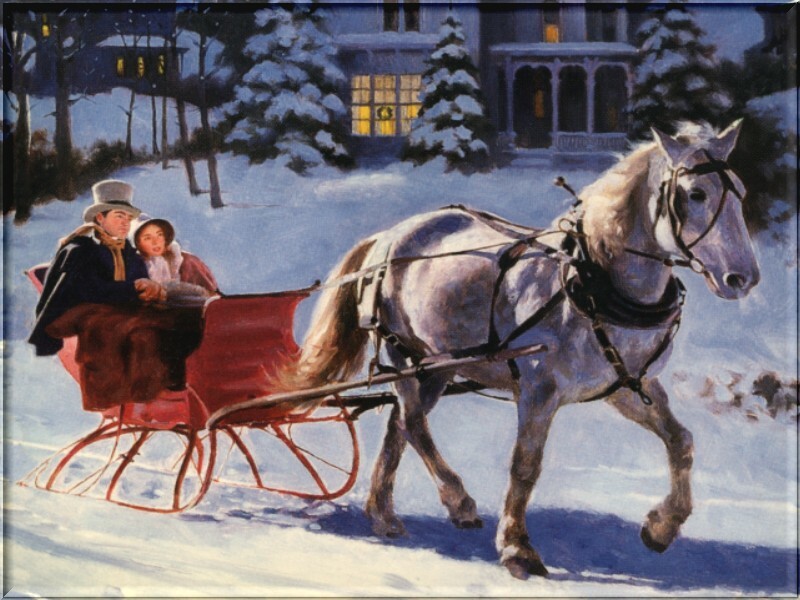 Have you ever been on a sleigh ride? Where/when? What was the weather like? What time of the day? On Nov 22, my history post will show antique children's and unique sleighs. Thanks for collecting them all, Anita. Lovely photos. It's so strange (for Barb as well, I'm sure) to know that people to the east and south of us are still without power. Living in 'the snow belt' along the Great Lakes, we like to think we should be first. This is fabulous, Anita. I love the two-seater bobsleigh, and the Canadian / Russian one. I just finished reading Washington's Lady, and there is a scene in there where Martha goes to visit George during the war, and before his men take her to him, the convert her carriage into a sleigh. I thought that was pretty cool. You're welcome Deb. I have to admit that working on this post, my Mountie story, the cold air and swirling leaves here at home and snow in the news is putting me in a Christmas mood. Losing power isn't fun though, so I'll remember them in my prayers. Now you've got me craving a sleigh ride. I've never been on one. I think it's the cold that has dissuaded me, so far. But there's this place in the hilly area just south of us, that does hay rides in the fall and horse-drawn sleigh rides in the winter. I guess they also stop at a little cabin-type place or hot chocolate mid-ride. I might just have to check it out this year. Anita, what a fabulous post. Thanks for compiling all of this information. I love the pictures. I've never been on a sleigh ride. As a kid, I went on wagon rides with Santa, however. No snow. I think I need a sleigh ride! I hope power gets restored soon to those in the NE. Scary. Dina, I went through my research to find the origin of the sleigh and for the first time in all my researching days, I can't find it. 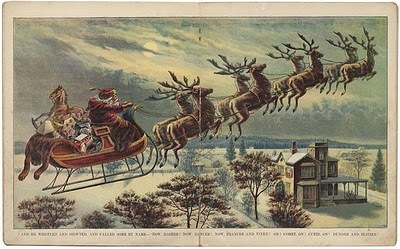 I know it was first referred to as Santa's sleigh around 1821. 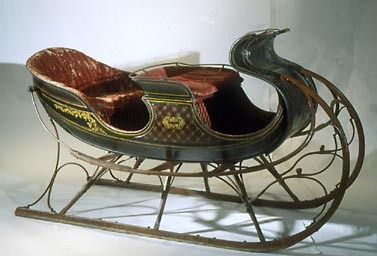 But the closest I could come to an actual date for sleigh or sled was the latter part of the 18th century and that was for an Inuit dogsled. While I was searching however, I found more info on the Canada/Russia sled I'd mentioned in my post so I updated that info and added 2 more images. Suzie, converting a wagon into a sleigh was quite common on the prairies, too. the son Remy never knew about. Nothing like having a captive audience when you want to speak your mind. Haha. Barb, I know exactly the kind of sleigh/hay ride you're talking about because I've been on several while living in Ontario. 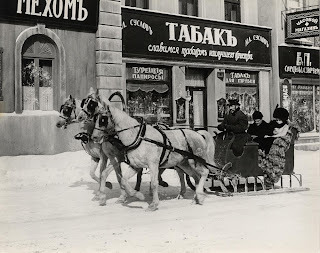 I'm working on another post with different types of sleighs and the one you're talking about is really a sledge or working sleigh. Of course, many outfits simply use a flatbed trailer with runners for wheels. And then some don't even bother to change the wheels to runners. Regardless, they pile straw bales down the centre of the sledge for people to sit on. The larger sledges/trailers have 2 or 3 bales across and a final one on top so that there are 3 levels to sit as you watch the scenery go by. 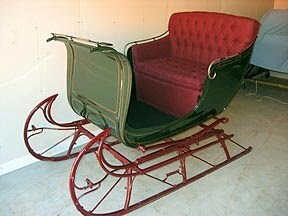 I've never been in a front-facing sleigh as those are more expensive to rent and everyone I know uses a sledge. About the cold, the main thing is to dress warm. Even if it's a nice night around freezing point, if you're sitting on a bale of straw on a sledge, the straw will poke at you - moreso if the farmer uses hay bales because those stems are harder and pointy. Straw has hollow stems and will lie flat. Hay has sharp, hard stems. But with good jeans and snow or even canvas pants, a hat, mitts and scarf, you'll be dressed for fun. And that hot chocolate really does the trick at the mid-way point. Shorter rides don't stop but serve the hot chocolate afterwards. Either way, it's a tradition. Although the day rides are fun, the evening ones are the best - especially with a cloudless night when the sky is filled with stars. The horses crunch snow beneath their hooves, grunting and blowing air out their noses. Sleigh bells ringing to warn animals off the trail. And God's handiwork above you. Gorgeous. Then someone breaks out in Jingle Bells and other Christmas songs and carols follow. Even on a cold night, I love it! Susie, much as it helps the ambiance, you don't need the snow. Some years there isn't enough snow to warrant putting on the runners so everyone stays on wheels. If it's close to Christmas and you go in the evening, a hay ride is the next best thing. I know because like I said, I've on those, too. Just go on a relatively cold night - out in the desert or up in the mountains. Because although snow may not be a requisite, it's hard to imagine it in the heat. At least it is for me. Oooh, Anita--that does sound fun. And the hay ride I was there for was like that. But this place does have actual sleighs they run as part of a coach and cutter service. They do formal and informal events. And even operate a B&B. Since they are in the area we call ski country, I guess there's some tourist money there. Only I can't seem to get their web site to open. It's supposed to be coachandcutter.com. I'm getting a 404 error for the www.coachandcutter.com site itself. This brought back wonderful memories. My folks bought a 19th century sleigh and a complete jingle bell harness when I was a kid. Never managed to get around to having any horses trained to pull, but having the sleigh was neat. Looking at the pictures I believe it must have been a cutter... I'll have to dig out the picture of the year they had a Christmas party and someone dressed as Santa at their boat shop! 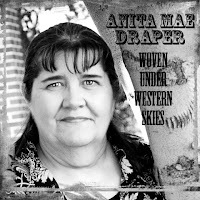 Thanks, Anita Mae, I'm feeling all nostalgic and Christmas-y now... good thing, since the snow is rolling in tonight! The temp here is only 8c/46F, but there's a wicked wind out there. I'm in my office and my nose is cold. Wait - I just checked my iPhone and it's down to 2C/34F outside. Ugh. love the post. 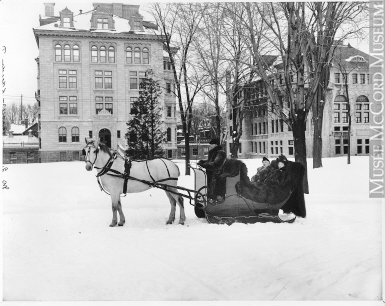 my favorite sleigh is definitely the Albany sleigh, followed by the Canadian sleigh. the Canadian one sort of looks like a ship. cant say i've been on a sleigh ride, but i've been on plenty of hayrides when i lived in Colorado. you're right, nothing is like a night ride with sleigh bells and stars overhead. i love reading your research posts - i learn so much. So I could take that both ways... either you love it because you've taken a sleigh ride in it... or you love the looks of it. Hmmm. Methinks it's the latter. This is awesome, Anita! I have a pic of my mom when she was a toddler sitting in a sleigh with her father. I think a mule was pulling it. Do you really have a pic of your mom in a sleigh being pulled by a mule? That is so precious! You have a book being released in Jan 2012, don't you? Do you want to promote it on Author Memories? All I ask is for your memories (circumstances) surrounding that pic of your mom in the sleigh with her dad and the donkey. Check out the blog using the URL at the bottom of Debby's post. All info about guidelines are on the Author Memories blog.